Because we work in communities so much and are so passionate about language preservation and reclamation, we have launched these beauties! 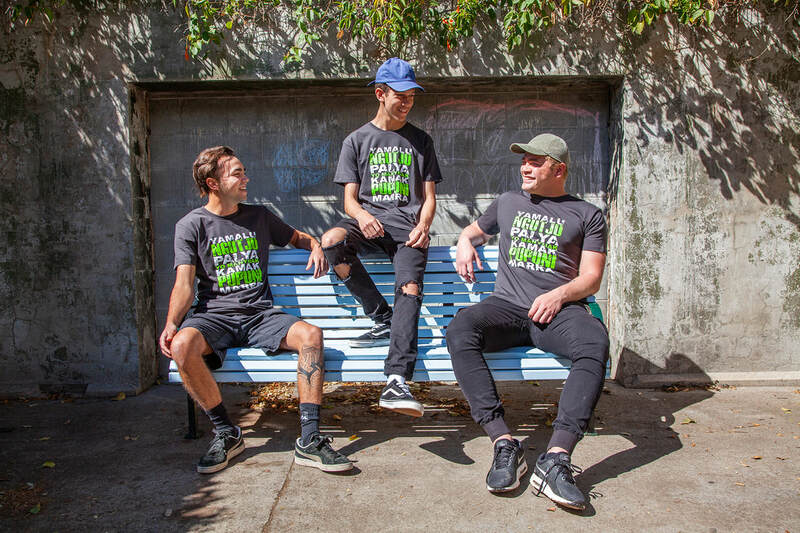 Each of these words on this Shellie Morris t-shirt translates to ‘good’ in English from various Aboriginal nations around the Northern Territory. We have obtained appropriate permissions from custodians for the use of these words on this range of T-shirts. 20% of profits from the sale of the shirts are set aside for continued music projects in these communities. Here are the 7 words, the language group and the geographical location they are from. 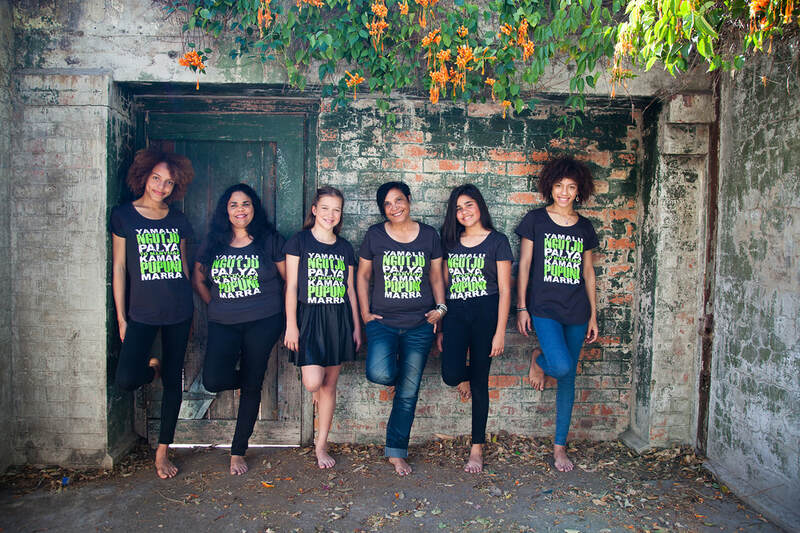 We are grateful to Monita Roughsedge for her work on this design, LaVonne Bobongie Photography and our wonderful models: Aurora, Julie, Tanahia, Shellie, Kyah and Pleiades for the women's tees and our men: Kane, Tai and Dylan. 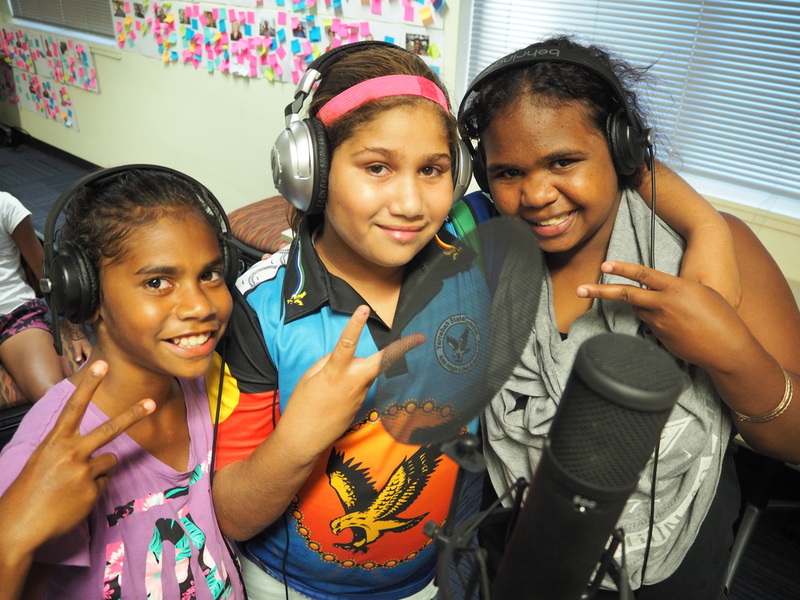 Young girls recording a song they created with Shellie. Shellie Morris has spent the past 25 years honing her skills as a story teller and musician. She has learnt from communities around the world and worked with them engaging in music as a healing tool. She imparts the importance of having a voice and that each individual is important whether she is in the desert or the city. While she has been in the spotlight over the years for her involvement with Black Arm Band, Deadly awards, ARIA nominations, Music Australia award, NAIDOC Award, G.R. Burarrawanga Memorial Award and Australian of the Year award; by and large, she works on the ground empowering and gently effecting change. Since discovering her Warduman and Yanyuwa roots, she has tirelessly worked to improve the lives of Indigenous Australians, especially in the Northern Territory. The documentary has won film and humanitarian awards around the world and is nominated for five AACTA awards (including best sound and score), ATOM Awards - Best Indigenous Resource and a Walkley Documentary Award to name a few. ​ She has worked with numerous organisations using music as a healing tool and also as an educational tool, highlighting in subtle but powerful ways the importance of numeracy, literacy and education as a whole. Her power to impact lies in her ability to make these learnings relevant to the country, place and language of the land and individuals she is working with. People are engaged because they are invited, feel included, have ownership and the process and end product is meaningful to their lives in very relevant ways. Shellie has worked in more than 80 remote and urban Indigenous communities delivering music workshops in songwriting, singing, arranging, composing and performance to Indigenous children, young people, adults and elders from Cape York in Far North Queensland to Tasmania, from Arnhem Land in the Northern Territory to the Pitjantjatjara lands of South Australia and from the Kimberley region to the Ngaanyatjarra lands in Western Australia.